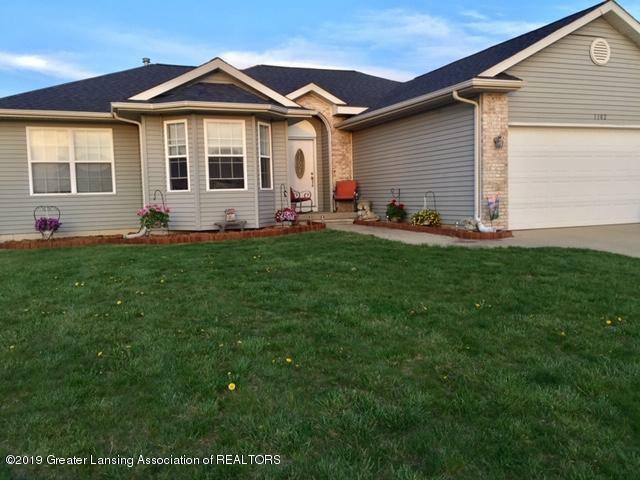 Great newer home with 4 bedrooms, 2.5 baths, finished lower level. Fenced back yard too!Quiet area & walking distance to elementary school! Easy care living with cozy foyer entry into living room with cathedral ceiling, four window wall, great view of back yard. Open dining area & sliders to deck. Kitchen has snack bar area & all appliances stay (newer dishwasher & refrigerator). Tucked in by kitchen-garage entry-foyer is laundry area with sliding door & big coat closet. Hallway has brand new flooring & leads to 3 bedrooms, closet & main bathroom. Master bedroom has walk in closet & full bath & step in shower. Lower level is family room & new kitchenette-wet bar area & 4th bedroom with egress window & corner computer desk. Storage area, mechanical room, new water heater 2018.